I had a lot of other projects going on, so I let a few ideas roll around in my mind for a bit while I worked on other things. One night I realized that I had quite a few HSTs left over from another quilt (which I haven't finished yet, but I'll share as soon as it's done!). Within an hour or so I had the HSTs sewn into this top! It's a lot of fun to play with color value! The other quilt I'm working on has a different look to it, but I couldn't resist the simple, stunning effect of this layout. With the top done, I set it aside to think about how to quilt it. I think I set it aside for a bit too long, because suddenly I realized that I had a week to finish the quilt and ship it to Illinois. Plus there was a 3-weekend with no mail delivery! 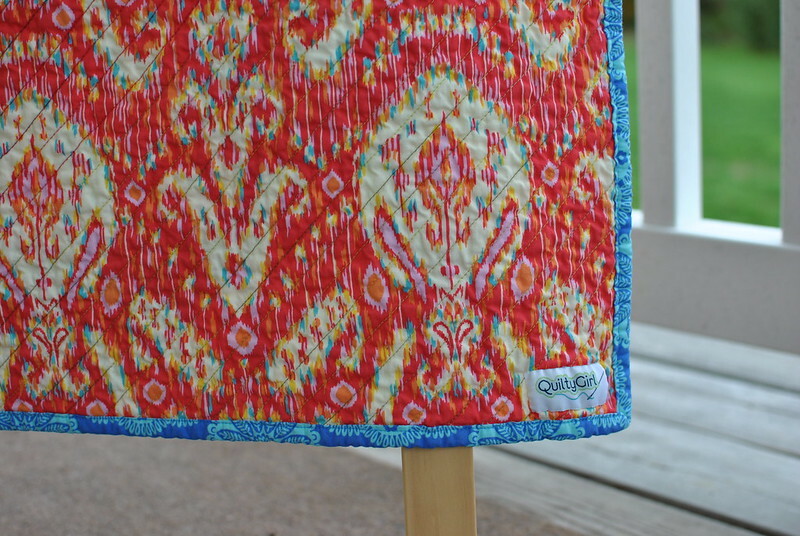 I started out with a free motion quilt design that I found in Angela Walter's book, but I didn't feel like it flowed with the quilt top. I had less than 1/6 of the quilt done, but it still took me several hours to pick out the stitching! 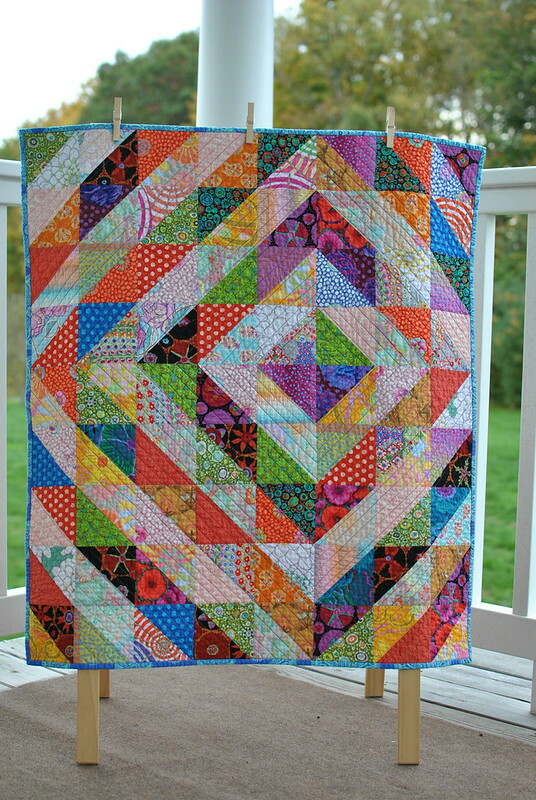 I ultimately went with straight line quilting, which was my first instinct all along... I chose a purple variegated thread for the quilting, but with less than half of the quilt done, I ran out! At this point I just wanted to finish the quilt and send it off, so I decided to simply finish with another color thread. I had a pink variegated thread, which was the same brand and style as the purple, so I chose that. 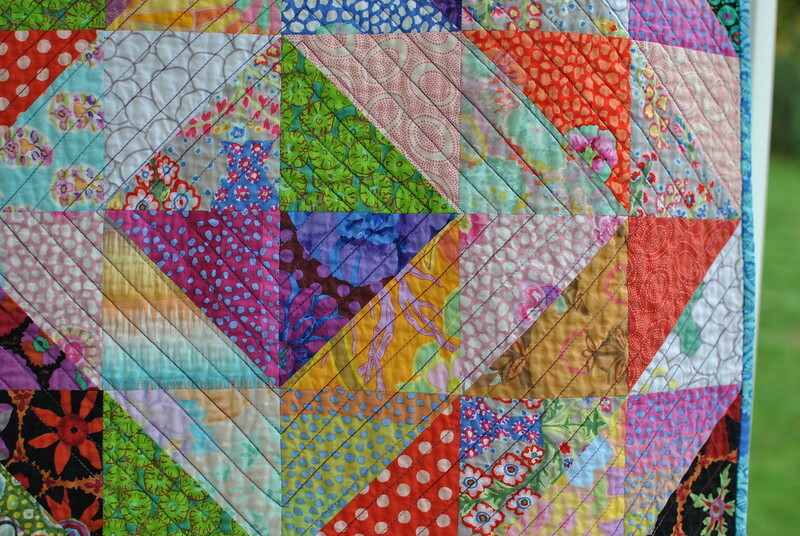 Just when I thought I'd never finish this quilt, I ran out of thread AGAIN! By this time I was actually laughing out loud. I had yet another variegated thread in my stash (this one was green, and a different brand), so I pulled that out. I figured that by changing thread colors twice, it would look more intentional. Right? In this picture you can kind of see that there are different colors of thread. 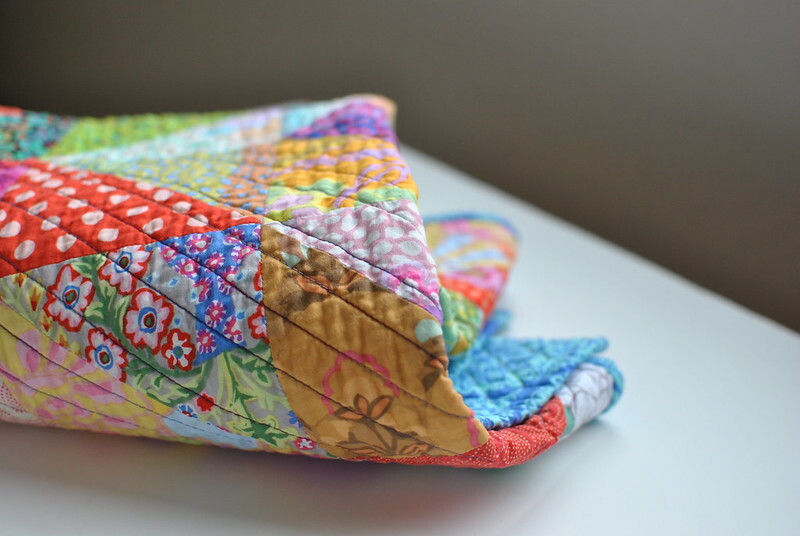 I was able to finish the quilting without running out of green thread (victory!). 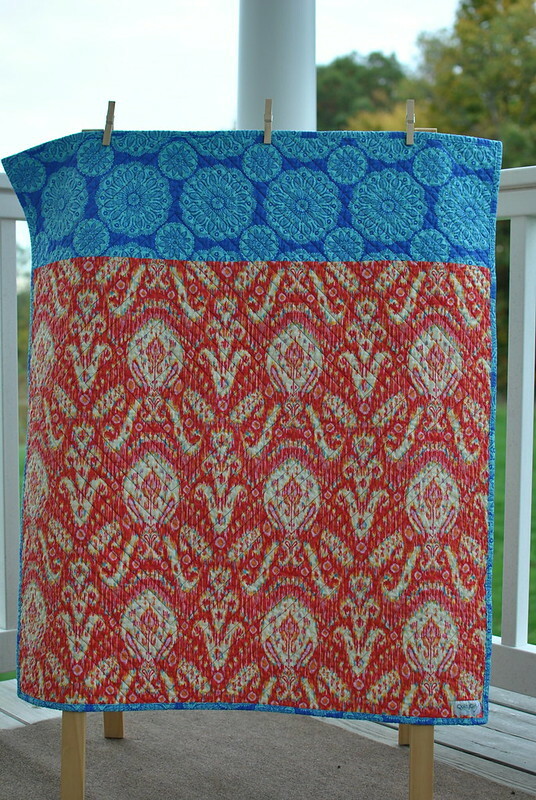 For the back of the quilt I chose an ikat print by Amy Butler and a blue print from my stash (sorry, I have no clue of the designer!). The blue print worked out really well for binding, too. 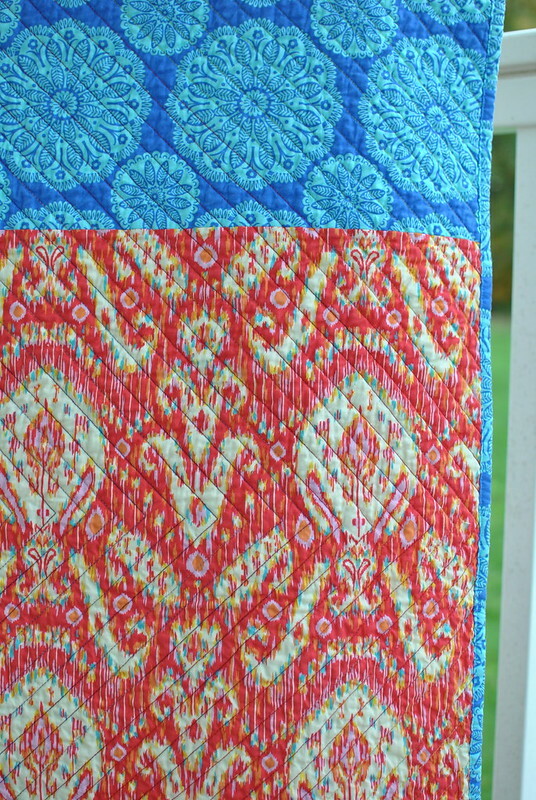 I'm really happy with how well these two prints play with the Kaffe Fassett prints! How fabulous is this ikat? I love it! I'm happy to report that the quilt did make it to Illinois in time for the benefit. 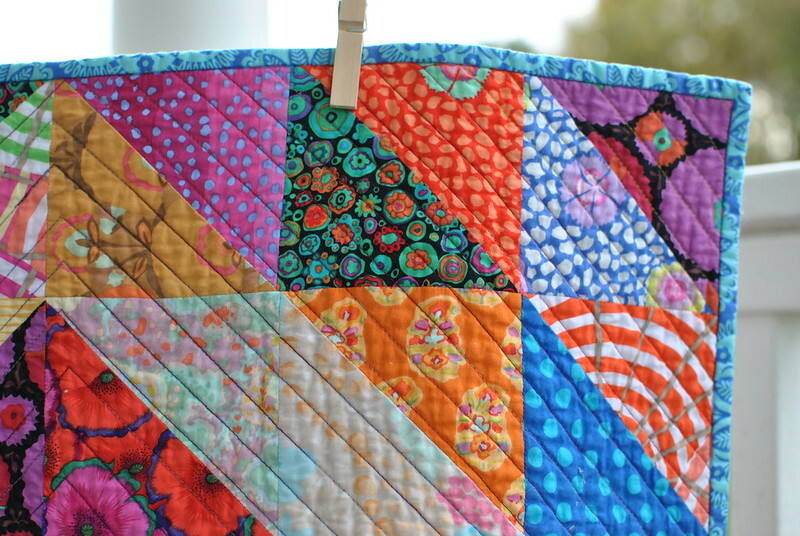 I'm not sure how much money the quilt itself raised, but I do know that the benefit raised a bit of money to help a friend of a friend with her cancer treatments. It was quite a rush to finish this project, especially with all of the other sewing I had going on, but I'm so glad I could be involved in this event! Finished size is 36" x 41"
Prints are mostly Kaffe Fassett with a few Brandon Mably prints. Backing is an ikat print by Amy Butler and an unknown print from my stash. 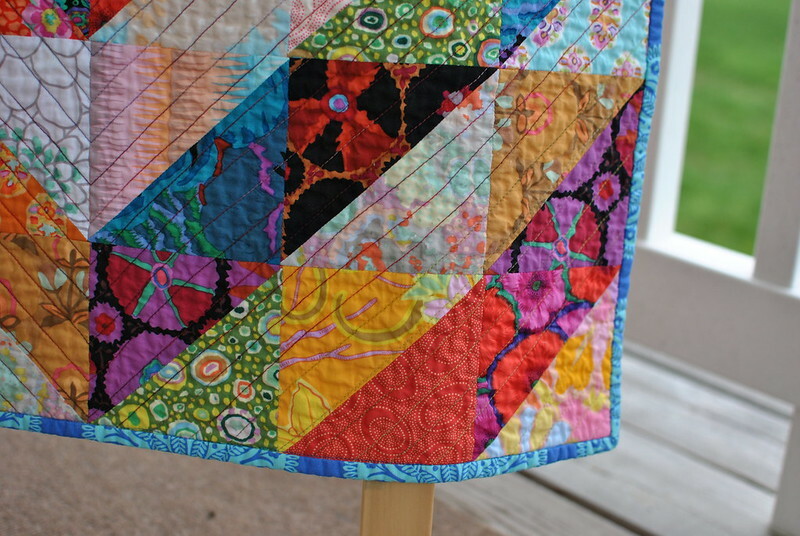 Straight line quilting in several thread colors. ;) Purple and pink are Signature threads, the green is Wonderfil.